Life has definitely been a whirlwind lately. The Man will be starting a new job soon, so the past month has been consumed with preparing for that along with visiting his parents and seeing his sister for a much needed 4-day, no internet, no cell phone vacation. Because it’s going to rain all week, I figured the weekend was my last shot at preparing the gardens for the summer and doing some much needed weeding and organization. Of course, the job was made much easier thanks to my little gardening helper, Abby. She has to work on her pruning technique, but her digging skills are definitely above par. 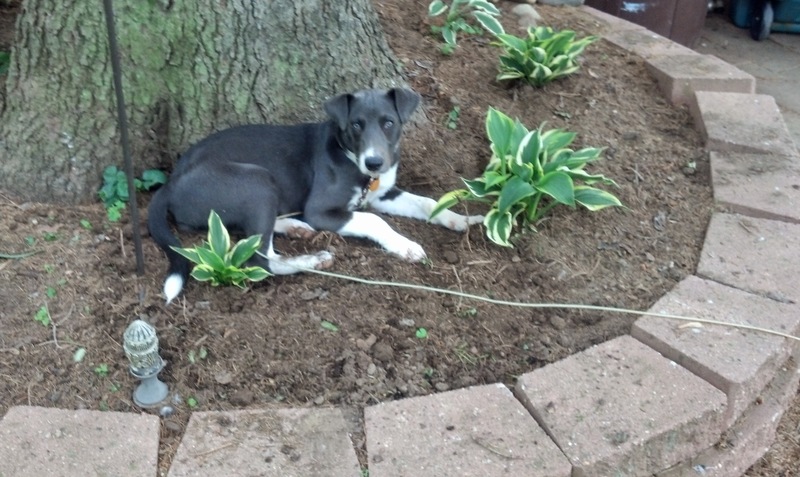 Here, she displays the “Twilight” Hostas that she helped me plant. She was a bit less helpful with the actual garden bed, but she did enjoy napping under the weeping cherry tree while I worked. 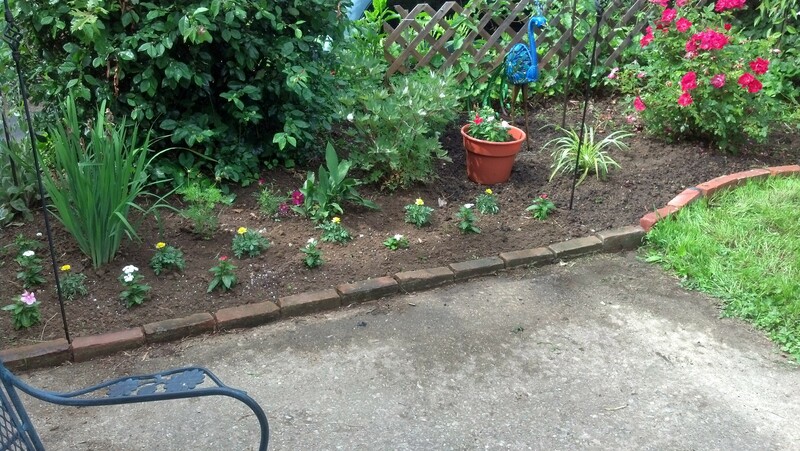 I was able to score some really healthy marigolds at Lowe’s to add to the vinca and cosmos that I got from my mom. My Siberian Irises and bleeding heart that I planted last year just finished blooming, and my Tickseed has yet to grow to full size for the season, so I was happy to add my new variegated Liriope (the spidery looking yellow and green plant) next to my knockout rose to add some interest to the bed along with Penelope (the peacock). It has always annoyed me that there was this dead space next to my back door, so I ended up using the bakers rack my mom gave me to use for storage by the back door for some of my herbs instead of hiding it down in the basement. My basil and french lavender are very happy, while my cilantro is still struggling along (as I tried to grow from seed this year). 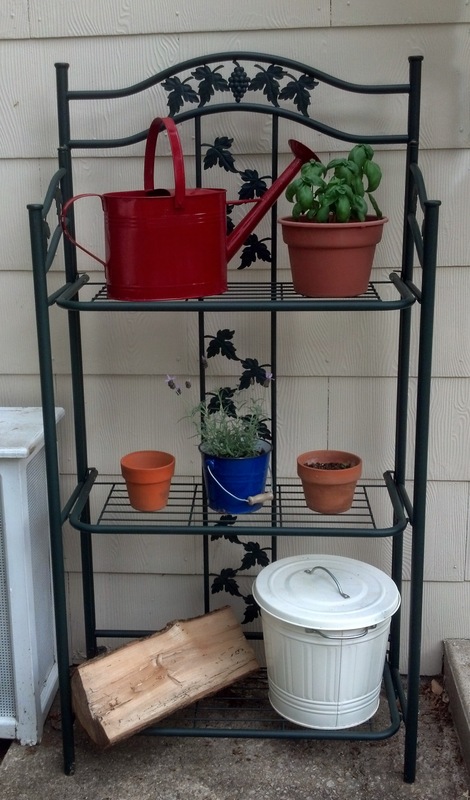 The nice thing is that the rack also can hold our white recycling pail and my watering can. I kept telling myself that I wasn’t going to focus on the outside this summer and was just going to let things be, but I was happy add some more perennials to the garden. The Man picked out two ornamental grasses – a dwarf Fountain Grass for the front and a Twisted Dart Rush for the vegetable bed – so those got planted as well. All in all, it was a gorgeous weekend to be outside and get some work down. Here’s hoping the rain finishes up in the next few days and the weather is gorgeous for this coming weekend as well!